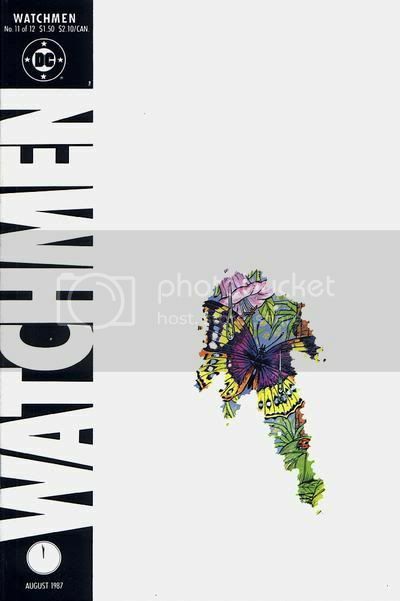 Cover Image: Like the other covers for Watchmen, this cover is well designed – a stark, white background with a glimpse of a tropical scene through a blinding snow. It may not be immediately evident, but this small opening in the snow is in the shape of the blood spatter from the Comedian’s smiley-face button, as seen in Chapter I. Panel 2: where we can see the same “blood spatter” opening into a lush, tropical scene. The speaker here is Adrian Veidt, and the first dialogue balloon in this panel – “…Burroughs’ cut-up technique…re-arranging words and images…allowing subliminal hints of the future…” – could certainly be seen as a meta-commentary on the manner in which the entire story of Watchmen was crafted, jumping back and forth through time, offering glimpses of the whole and forcing readers to glean what they could from the narrative of the future of the narrative. 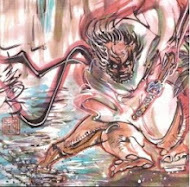 Panel 4: Veidt’s continuing commentary: “…an emergent worldview becomes gradually discernible amidst the media’s white noise…” accentuates the succession of images in these first few panels, as a lush, tropical landscape emerges amid the stark white of the blowing snow. Panel 5: Veidt’s commentary: “…this jigsaw-fragment model of tomorrow aligns itself…areas necessarily obscured…broad assumptions regarding this postulated future may be drawn…” can also be seen as a commentary upon his ultimate plan (and is also a meta-commentary upon the structure of Watchmen, from a storytelling point of view) where readers have been offered glimpses of the jigsaw puzzle that began with the murder of Edward Blake, while certain facets have been obscured to allow for overall conspiracy’s success (both within the narrative and as a reading experience). Panel 7: Note the buildings in the background are colored purple, signifying that they are indeed Veidt’s. Labels: Alan Moore, Chapter 11, chrisbeckett, cover image, Dave Gibbons, Page 1, Watchmen, Who Watches the Watchmen?